The vintage 1999 is just as underrated as 2000 is overrated, at least for those of us that love firm, classic, pure, long-lived and velvety Riesling that make the heart beat. Etienne Sipp in Ribeauvillé makes nothing but excellent wines, with a fabulous ability to chisel out the most important feature of a great wine: balance. 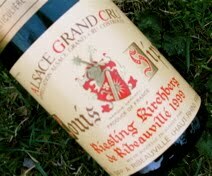 1999 Riesling Grand Cru Kirchberg has a fully developed aroma of arrack, chalk, wild strawberries, turpentine, ripe apples and candied lemons. The taste is medium-bodied, fruity and clean, and the wine coats the mouth with sweetness without sugar and tartness without any bitterness. The finish is long, full of the Ribeauvillé minerality and really, really good. Price: € 14.50.